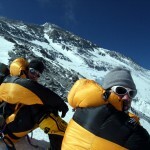 This is a short post briefly describing our successful ascent of Everest by the North Ridge on Saturday 19 May. I’ll describe it in more depth in a later post, once I’ve recovered from summit exhaustion and had more time to reflect. I’m also aware there were a number of fatalities on Everest on 19/20 May, including on the north side. Information about these have emerged gradually as we’ve descended by a series of rumours and contradictions. I don’t want to comment on these until we can be more sure of the facts, but my thoughts are with the families and loved ones of those who died, especially any whose final hours I may have brushed. The North Ridge of Everest is a dangerous place, and not at all what I expected, despite having read a great deal about it. This wasn’t a snow climb, but a rock scramble. Prominent features such as the First, Second and Third Steps are well known, but there was much scrambling in between. 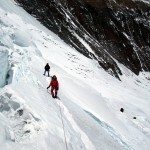 “I counted at least eight steps,” said fellow climber Mark Dickson. Much of the summit day route involved walking across narrow rock ledges just about wide enough for a boot, sloping downwards at an angle with a light dusting of snow, and containing three or four old ropes to snag your crampons on. Below the slabs is a horrifying 3000 metre drop down Everest’s North Face. Concentration was required almost every step of the way, and there were very few places where you could relax. The photo I’ve chosen for this post shows an example of these. It was taken above the Second Step, and shows climbers descending across slabs towards the First Step. With Chongba I was probably the last person to summit that day, at 10am. There was no sense of elation, for I knew how long and hard the descent was going to be. Throughout the climb I was repeating the mantra in my head: must get down safely, must get down safely. My summit day took 18 hours, and again we were probably the last into camp at 5.30. One of the reasons I took so long was undoubtedly exhaustion, but I was also being so careful. I didn’t mind how long I took as long as I didn’t make any mistakes. And throughout those 18 hours Chongba never left my heels. I can’t describe how reassuring it was to feel his footfall behind me. Had he not been there I’m sure I would have turned back through fear long before I reached the summit. This was his 13th Everest summit. In all 11 members of the Altitude Junkies team reached the summit between 6.30am and 10am. The only members of our team not to reach the top were Margaret Watroba, travelling with Chedar Sherpa and Nima Neru Sherpa. Margaret made the wise decision to turn back at the Third Step. That’s why she’s still alive. She made a similar decision on the South Summit in 2010, but she does have the great consolation of having reached the summit from the south side last year. We were blessed with perfect weather throughout our summit day. Had we not been so I can’t imagine how dangerous the North Ridge would be. 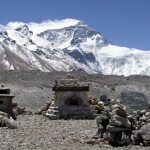 We’re now all safely back in Base Camp, and will be heading to Kathmandu in a couple of days. As we sat in the dining tent yesterday with a celebratory glass of champagne, Ian Cartwright summed our summit day up for me. The mountain gods were kind to us on 19th, but not everyone was as lucky as we were. you are amazing. congratulations. I will forever enjoy reading your posts about your many adventures in life. Congratulations! I’ve been following your expedition for the past few weeks, and was a little worried when I didn’t see a posting on your site after ~14 May, and the events of 20 May. The Altitude Junkies site, however, had a post that said you had summited on 19 May, and all were on the way back down. Enjoyed your Thieves, Liars, . . . book on the Gasherbrums, got your Climbing Nepal’s Treking Peaks, looking forward to reading it too. Take care, have a good return to the U. K.
Thanks, guys. We’ve been shocked to learn of the number of deaths on Everest while we were up there, and I know it’s been a relief to many of those following us that Phil was able to make updates to the Junkies site by sat phone. There are many different summit stories; ours was of a relatively quiet summit day with perfect weather. I hope people don’t focus solely on the tragedies, although the commercial media always will. Congratulations Hoz. A superlative achievement. Tony and I will line up a pint of “Bishop’s Guff” or whatever it is you drink on your return to Blighty. Congratulations on your summit, well done! That is a stunning achievement. Congratulations. You have managed to do so much in the past 2 1/2 years. Hi Mark, once again, congratulations! Although I hope you’ll appreciate that my praise is tempered by the fact that I’m so green with envy I wouldn’t look out of place on Mars! For someone who describes themselves as a ‘keen hill walker’, it’s an incredible achievement, but the real challenge lies ahead… how to work it into polite conversations with other keen hill walkers once back in the UK, without it looking like you’re bragging! So to reiterate Ken’s question, what ARE you going to do next?! Thanks everyone for the kind words. As to that popular question ‘what’s next’, I have no idea – rest and relaxation back at sea level, then we shall see. I certainly won’t be retiring from mountaineering! Been following your website for a while. Thank you so much for such a wonderful blog. I remember recently I read from one of your articles that the happiness hit you after one climb in Xinjiang, China. The words gave me chill and truely inspiring. I would like to read it again and share with friends but unfortunately I couldn’t find it anymore. Could you please kindly advise which article is that paragraph from? Thanks. Although it was a bigger achievement, I don’t remember having that feeling after I came down from Everest. I was too knackered! Yup! That’s what I was looking for! Such a great post! Thank you so much! Great. Glad you liked the video – I have Messrs Dickson and Rawlinson to thank for the performance! Thanks, Kate. Yes, the post was written as soon as I was safely back in Base Camp, hence the emotions were still quite raw! 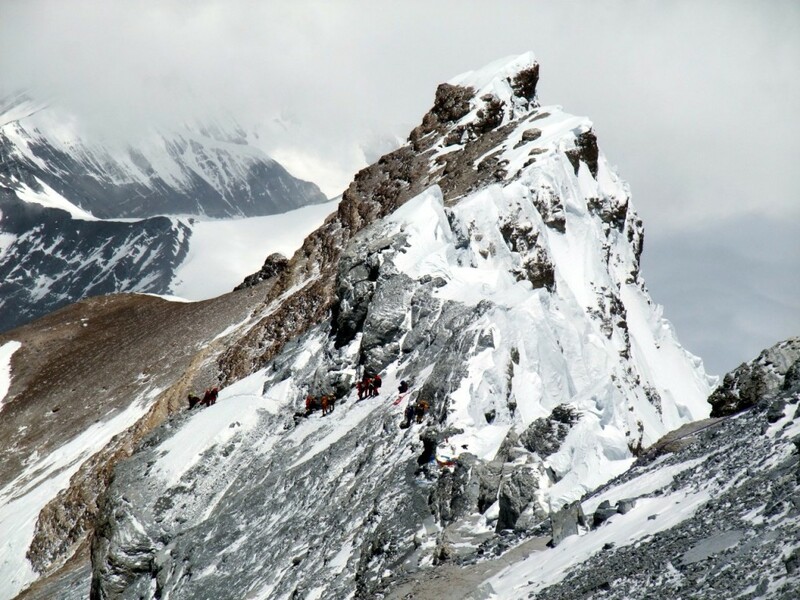 It’s an incredible experience of urs as The Everest North Face summit route is very complex and difficult as well as the summit day is long and tiring. but i m so pleased that u made it.. Cheers. Has the Chinese 1975 ladder been removed? From these pictures it seems to be gone. Is the ladder shown here going to be permament or just for the season? I came across your website this weekend. Great – one of the best sites. But looking at the closeups of the pictures around and about the first and second steps, how could M&I traverse that area, let alone find the ‘correct’ route?!? Yes, the ladder is still a permanent fixture. I don’t think route finding would have posed a problem for George Mallory and Sandy Irvine – just follow the ridge. There is a short traverse beneath the summit pyramid, but it’s not complicated.